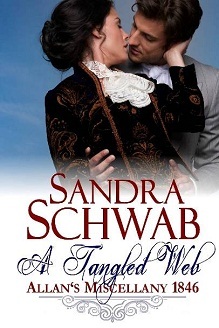 Get a free copy of A Tangled Web with the rest of Sandra's Starter Library when you sign up for her newsletter! Throughout 1846 much ridicule was heaped on Matthew Cote Wyatt's planned statue of the Duke of Wellington on his horse Copenhagen. Many Londoners considered it a monstrosity: the Daily News, for example, called it an "atrocious violation of all artistic principles" and an "artistic eyesore" (16 Sept 1846). The artists and writers of the satirical magazine Punch took great delight in speculating whether the statue would be the cause for horrible nightmares or whether it would tear the world asunder when it fell off the triumphal arch on which it was to be placed. & two lovers caught in a web of deceit and lies. Her whole life Sarah Browne has been told how plain she is, how nondescript, destined to become an old maid. For years she has been her family's dutiful nursing maid, but now a secret inheritance and an encounter with an artist, the charming Mr. Pelham, seem to offer her a chance to break out of her life of duty and drudgery - if she dares to take it. Yet how could such an interesting, witty man be possibly interested in her boring self? And so, Sarah soon find herself entangled in a web of lies and deceit, which might cost her the love of her life. "Once again [Schwab] weaves brilliantly researched historical details into a story that is not only irresistibly romantic, but also sparkles with wit. To top it off, she has come up with an enchanting couple that truly earns their happy ending." Fog rolled up from the river and wrapt the city in a white shroud. It muted the sounds of the busy metropolis and turned the people, the carts, and carriages out and about in the streets into ghostly apparitions. An old-fashioned travelling coach made its way up Piccadilly towards Mayfair. Inside, a young woman sat ramrod straight and silent like a marble statue. She wore deep mourning and had her dark hair tied back into a severe knot, which emphasised the signs of tiredness etched into the skin around her eyes, making her look haggard and older than her twenty-nine years. From time to time she would glance out of the window where shadows of the world flitted by as if it were the Lady of Shalott’s magic mirror. Aunt Em had enjoyed Tennyson’s poems, so Sarah had been obliged to read them out aloud so often that she knew many of them by heart. Unlike the unfortunate Lady of Shalott, Sarah had never transgressed against the rules imposed upon her, had never looked out of the window of the enchanted tower, had never been led into temptation by a knight’s glittering armour. No, Sarah had always been dutiful, had always submitted to her family’s wishes because, after all, she was just Sarah, the youngest daughter whom nature had not endowed with beauty. And so, by her family’s decision, her lot had been to be dutiful—for ten long years, when she had first cared for her ailing father and then later for her greataunt. Now she returned to a home she had not seen in a decade, and in her carpet bag lay a letter from Aunt Em bearing the inscription To Miss Sarah Browne—for services rendered. Inside the envelope was a short note directing her to an adress here in London. Not a word of affection, nor a word of thanks. No, simply for services rendered as if she had been nothing more than a servant. Sarah grimaced. Aunt Em had never been particularly affectionate, but she had always insisted on paying her debts—apparently even those owed to a dutiful greatniece. When the coach finally arrived at her family’s elegant townhouse, there was nobody there to greet Sarah except for the maid, who directed her to a small room upstairs. Sarah was informed that after freshening up, she was to to to the study, where Mr. Browne awaited her. And so, half an hour after her arrival, Sarah was sitting in her brother’s study, her hands placed in her lap, her eyes demurely lowered. “She was very fond of her small dog, who died five years ago,” Sarah offered. And thus, she was dismissed.